Abnormalities in lymphocyte signaling cascades are thought to play an important role in the development of autoimmune disease. However, the large amount of cellular material needed for standard biochemical assessment of signaling status has made it difficult to evaluate putative abnormalities completely using primary lymphocytes. The development of technology to employ intracellular staining and flow cytometry to assess the signaling status of individual cells has now made it possible to delineate the perturbations that are present in lymphocytes from patients with autoimmune disease. 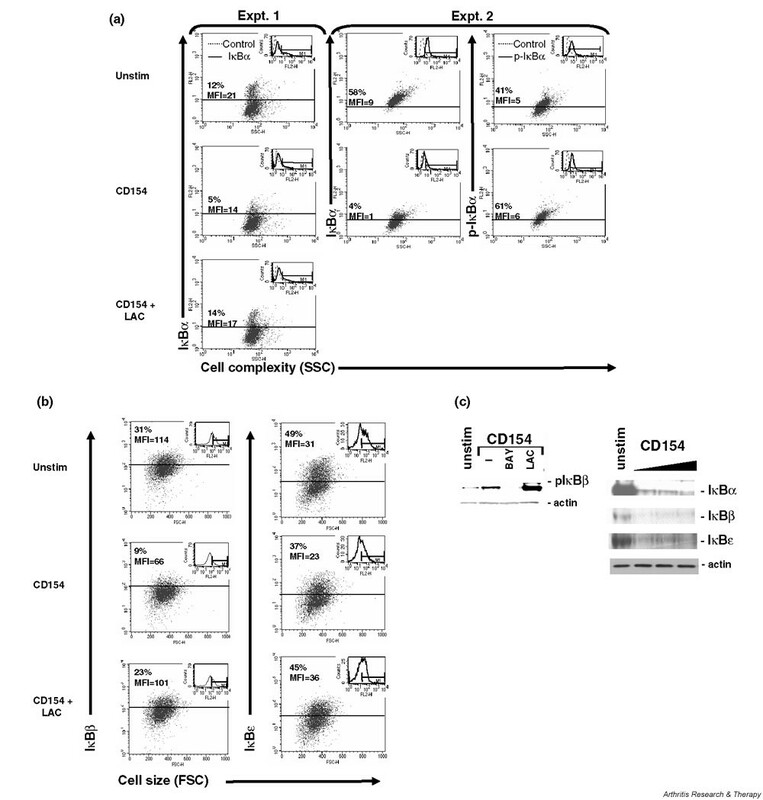 As an example, human B cells from the Ramos B cell line and the periphery of systemic lupus erythematosus (SLE) patients or normal nonautoimmune controls were assessed for activation of the NF-κB and mitogen activated protein kinase (MAPK) signaling cascades by intracellular multiparameter flow cytometric analysis and biochemical Western blotting. In combination with fluorochrome conjugated antibodies specific for surface proteins that define B cell subsets, antibodies that recognize activated, or phosphorylated inhibitors of κB (IκB) as well as the extracellular regulated kinase (ERK), jun N-terminal kinase (JNK) or p38 MAPKs were used to stain fixed and permeabilized human B cells and analyze them flow cytometrically. Examination of the known signaling pathways following engagement of CD40 on human B cells confirmed that intracellular flow cytometry and Western blotting equivalently assay CD154-induced phosphorylation and degradation of IκB proteins as well as phosphorylation of the MAPKs ERK, JNK and p38. 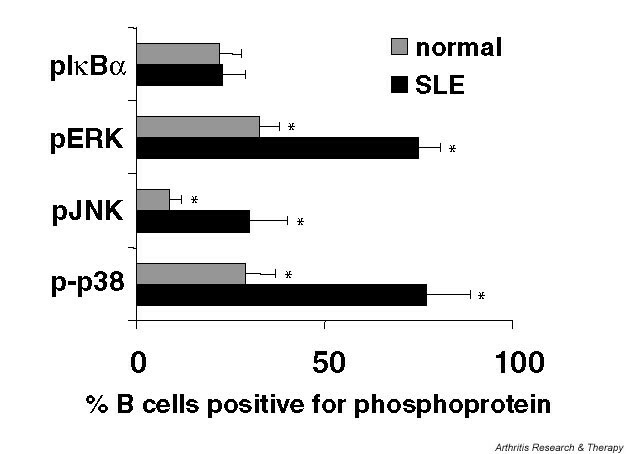 In addition, B cells from the periphery of SLE patients had a more activated status immediately ex vivo as assessed by intracellular flow cytometric analysis of phosphorylated ERK, JNK and p38 when compared with B cells from the periphery of normal, nonautoimmune individuals. Together, these results indicate that multiparameter intracellular flow cytometric analysis of signaling pathways, such as the NF-κB and MAPK cascades, can be used routinely to assess the activation status of a small number of cells and thus delineate abnormalities in signaling molecules expressed in primary lymphocytes from patients with autoimmune disease. Engagement of surface molecules on lymphocytes initiates signaling cascades that change the quantity and biochemical nature of transcription factors that interact with DNA, thus altering gene expression and cellular function. Numerous contributions from the scientific community have yielded insights into the complex nature of the initiation and control of these intracellular signaling pathways. The vast majority of these studies were performed with human cell lines or genetically manipulated mice, using biochemical techniques to follow cytoplasmic events with in vitro kinase assays or Western blotting experiments with phosphospecific antibodies and nuclear events with electrophoretic mobility shift assays (EMSA) or with transfected reporter constructs that assay the induction of transcription regulated by specific factors. While informative, it has been difficult to adapt these biochemical approaches to the study of primary human cells, especially those collected from lymphopenic patients with autoimmune diseases for which minimal amounts of cellular material are available. Specifically, analysis of signal transduction in primary cells, especially in primary systemic lupus erythematosus (SLE) B cells that constitute a small percentage of the peripheral blood cells, has been challenging because of the large number of cells needed for biochemical assessment of signaling status and the relatively poor efficiency of transfection of primary cells. Recent advances in the instrumentation and reagents commercially available for multiparameter flow cytometry have encouraged the development of intracellular staining techniques to assess the status of signaling proteins that, when phosphorylated, translocate to the nucleus, such as signal transducers and activators of transcription (STATs), and kinases that are phosphorylated when activated, such as mitogen activated protein kinases (MAPKs). Intracellular flow cytometric assays have been developed to assay general phosphorylation of tyrosine (pTyr) as well as to analyze specific amino acid phosphorylation of STATs (tyrosines) of the JAK-STAT signaling cascade (STAT-1, -4, -5 and -6) as well as of the MAPKs (threonine/tyrosine), extracellular regulated kinase (ERK), jun N-terminal kinase (JNK) and p38. The earliest experiments that utilized multiparameter intracellular flow cytometry to follow kinase activation were performed using activated human primary T cells and were published 10 years ago . In this 1994 study, human peripheral blood mononuclear cells (PBMCs) were stimulated with anti-CD3 monoclonal antibody (mAb), stained for CD2 with a phycoerythrin (PE)-conjugated mAb, fixed with 1% paraformaldehyde, permeabilized with 0.2% saponin and analyzed for tyrosine phosphorylation using fluoroscein (FITC)-conjugated anti-pTyr mIgG1 antibody (clone PT-66; Sigma, St Louis, MO, USA). A later paper from this laboratory also showed pTyr-FITC staining in activated primary human peripheral T cell subsets with the addition of PE-conjugated antibody to CD4 or CD8 . Similar results were obtained by biochemical Western blotting as well as by multiparameter flow cytometric analysis. A 1995 study demonstrated analysis of pTyr in activated human PBMCs that had been stained with PE-conjugated anti-CD3 or anti-CD4 following fixation with 3% paraformaldehyde and permeabilization with 0.15% Triton X-100 with a rabbit anti-pTyr antiserum followed by an FITC-conjugated donkey F(ab)'2 anti-rabbit Ig secondary . As a control, phosphorylated tyrosine, but not serine, competitively inhibited staining of pTyr detected by intracellular flow cytometry. A subsequent study demonstrated that biotinylated anti-pTyr mIgG2b mAb (clone 4G10; Euromedex, Souffelweyersheim, France) developed with FITC-conjugated strepavidin could be used in combination with peridinin chlorophyll protein (PerCP)-conjugated mAb specific for CD4 or CD8 in activated whole blood samples from normal or lymphopenic individuals to identify pTyr staining in human T cell subsets . In this study, surface proteins were stained followed by red blood cell lysis with the proprietary 'FACSlyse' reagent from Becton Dickinson (San Jose, CA, USA), with fixation in 4% paraformaldehyde and permeabilization with 0.1% saponin. Another study demonstrated that pTyr staining with the initially published  FITC-conjugated PT-66 anti-pTyr mAb (Sigma) could be performed in activated whole blood following red blood cell lysis and lymphocyte fixation using the proprietary 'FACSlyse' reagent from Becton Dickinson or a combination of ammonium chloride and 1% paraformaldehyde, with either treatment followed by permeabilization with 0.05% saponin. Simultaneous staining was performed with PerCP or PE-Cy5 conjugated mAb to surface markers such as CD45. Importantly, this study demonstrated that fresh or cryopreserved cells from sources such as normal or malignant (acute myelogenous leukemia, chronic lymphocyte leukemia) peripheral blood, cord blood or bone marrow yielded equivalent results. Recently, an additional study demonstrated staining of pTyr (clone pTyr-100; Cell Signaling Technologies, Beverly, MA, USA) with fluorochrome conjugated mAb in the activated human Jurkat T cells using a 1% paraformaldehyde fixation step followed by permeabilization with 0.1% saponin . These five studies suggest that pTyr can be analyzed by multiparameter flow cytometry in bone marrow as well as in PBMCs or whole blood from the periphery or umbilical cord using 1–4% fixation with paraformaldehyde following by permeabilization with 0.05–0.2% saponin or 0.15% Triton X-100. Equivalent results were obtained from Western blotting and multiparameter intracellular flow cytometric analysis of pTyr. Importantly, cryopreservation did not affect intracellular flow cytometric analysis of pTyr when staining was directly compared with pTyr staining in parallel fresh samples. Finally, surface staining could be performed before or after staining for pTyr depending upon the surface marker analyzed. Initially, pTyr [1–6] was analyzed using antibodies that recognize phosphorylated tyrosine but did not specifically recognize the identity of the kinase phosphorylated. Later studies examined specific kinases phosphorylated at unique amino acids. For example, activation of STAT-1, -4, -5 and -6 that are phosphorylated at specific tyrosine residues were examined under a variety of circumstances. The first study demonstrating phosphorylation of the STATs by intracellular flow cytometry was published in 1999 and showed detection of pSTAT1 following in vitro activation. PBMCs from normal individuals or patients with a genetic deficiency in IFNγR1 were activated with IFNγ, fixed and permeabilized using a two-step Caltag (Burlingame, CA, USA) proprietary reagent ('Fix and Perm') with the addition of methanol, and stained with a mAb specific for pSTAT1 (Transduction Laboratories, Los Angeles, CA, USA) followed by an FITC-conjugated F(ab)'2 specific for mouse mAb . A later study showed staining of the U937 monocytic cell line with Alexa 488-conjugated anti-pSTAT1 mAb (pY701, Clone 14; BD Pharmingen, San Jose, CA, USA/Transduction Laboratories)  following fixation with 1.5% paraformaldehyde and permeabilization with methanol. This study also demonstrated staining of pSTAT5 (pY694, Alexa 488-conjugated clone 47; BD Pharmingen/Transduction Laboratories) and pSTAT6 (pY641, Alexa 647-conjugated clone 18; BD Pharmingen/Transduction Laboratories) in the human U937 monocytic cell line. An important aspect of this study showing phosphostaining of STAT-1, -5 and -6 was the demonstration that cells could be stored at -20°C for several weeks before staining. An additional study at this same time demonstrated staining of phosphorylated STAT5 (Y694, mAb clone ST5P-4A9; Zymed, San Francisco, CA, USA) followed by FITC-conjugated rabbit anti-mouse Ig secondary (DAKO, Carpenteria, CA, USA) in CD45+ gated blasts (PerCP anti-CD45 mAb) from fresh or cyropreserved blood or bone marrow samples from untreated acute myelogenous leukemia patients that were fixed and permeabilized with the 'Cell Permeabilization Kit' from Harlan Seralab (Loughborough, UK) followed by methanol . Of note, this study demonstrated that liquid nitrogen cyropreserved samples could be used for pSTAT5 analysis and that surface staining for CD45 could be performed after the pSTAT5 staining. Finally, an independent study detected phosphorylated STAT4 in activated human PBMCs or mouse splenic cells following the two-step Caltag 'Fix and Perm' proprietary reagent and methanol with rabbit anti-pSTAT4 (Zymed) followed by FITC-conjugated goat anti-rabbit secondary (Caltag) . Splenocytes from STAT4-deficient mice were used as a control. This study demonstrated that flow cytometric analysis of phosphorylated STAT4 was much more sensitive than Western blotting and that total STAT4, in addition to pSTAT4, could also be detected by intracellular flow cytometry. These four studies [7–10] suggest that pSTATs can be analyzed by multiparameter flow cytometry in PBMCs or murine splenic cells using fixation with the proprietary Caltag system or 1.5% paraformaldehyde, with either treatment followed by exposure to methanol. Additionally, it was confirmed that cells can be cryopreserved at -20°C or with liquid nitrogen for several weeks before staining. Moreover, similar to the results with pTyr, surface staining can be performed before or after staining for pSTATs depending upon the surface marker analyzed. Finally, multiparameter intracellular flow cytometric analysis of phosphorylated proteins not only used many fewer cells than biochemical techniques such as Western blotting, but the flow cytometric technique, at least for analysis of pSTAT4, appeared to be tenfold more sensitive when compared directly to the Western blotting technique. The latest studies examining multiparameter intracellular flow cytometric analysis of signaling molecules in lymphocytes have assessed activation status of MAPKs such as ERK, JNK and p38 with mAb specific for dually phosphorylated threonine and tyrosine residues (ERK: pThr202/ pTyr204; JNK: pThr183/pTyr185; p38: pThr180/pTyr182). A study in 2001 examined activation of ERK in activated whole blood and PBMCs . Following lysis of red blood cells in whole blood by hypotonic shock, lymphocytes in blood or PBMCs were fixed with 2% paraformaldehyde and permeabilized with methanol. Phosphorylated ERK (pERK) was assessed in T cells with rabbit anti-pERK1/2 (Cell Signaling Technology, Beverly, MA, USA) followed by FITC-conjugated goat F(ab)'2 anti-rabbit IgG and PE-conjugated anti-CD3 mAb. Demonstration of specificity was provided by the finding that pERK staining was inhibited in the presence of chemical inhibitors of upstream kinases such as MKK1 (PD98059) or RAF (BAY37-9751). An independent laboratory subsequently published two studies that assessed pERK, phosphorylated JNK (pJNK) and phosphorylated p38 (p-p38) in activated lymphocyte subpopulations [5, 8]. The first paper  analyzed activation of MAPKs in phorbol ester-activated Jurkat T cells or negatively selected peripheral blood T cells following fixation with 1% paraformaldehyde and permeabilization with 0.1% saponin. The second paper  tested a range of fixation and permeabilization conditions and came to the conclusion that fixation with 0.5–3% paraformaldehyde followed by permeabilization with methanol, Triton X-100 or saponin, gave similar staining of MAPKs in activated Jurkat T cells or peripheral blood T cells, although the authors concluded that 1.5% paraformaldehyde followed by saponin was the optimal combination for intracellular flow cytometric analysis of phosphorylated proteins. MAPKs were detected with directly conjugated mAb (pERK-Alexa 488, pJNK-Alexa 647 and p-p38 Alexa 647; Cell Signaling Technology). Ethidium monoazide, but not propidium iodide, was successfully used for live/dead cell discrimination. Surface staining for lymphoctye subset markers was performed before fixation. These studies confirmed previous results that cryopreserved or fresh samples gave similar staining patterns for pMAPKs. In addition, these studies demonstrated that the exact method of fixation and permeabilization is not crucial for a successful analysis of many activated kinases (pTyr, pMAPKs, pSTATs, pAKT) by multiparameter intracellular flow cytometry. The signaling cascades involving MAPKs (ERK, JNK, p38) and proteins involved in regulation of the nuclear translocation of NF-κB (IκBs) have been shown to be critically involved in B cell differentiation leading to humoral immunity. Abberations in these signaling pathways have been shown to lead to, and be associated with, autoimmune diseases such as SLE [12–14]. SLE is an autoimmune disease characterized by the differentiation of plasma cells that secrete pathogenic autoantibodies . Examination of the role of signaling molecules in the differentiation of Ig-secreting plasma cells has been performed in vitro as well as in vivo. For example, mice deficient in the NFATc1 and NFATc2 transcription factors, that are located downstream of the ERK and JNK MAPK pathways, have increased numbers of polyclonal, spontaneously generated, long-lived plasma cells producing IgG1 and IgE . Moreover, (NFAT) c2-/-c3-/- double knockout mice have increased numbers of all types of Ig-secreting cells . The relationship of these results to autoimmunity is emphasized by the observation that NFATc1 (18q23), NFATc2 (20q13.2-3) and NFAT-c3 (16q13-14) are located in genetic regions [18–21] of previously described human SLE susceptibility loci (AC Grammer, unpublished observation). In addition to being negatively regulated by NFAT, the plasma cell differentiation program is negatively regulated by ERK, which has been shown to inhibit expression of the BLIMP1 transcription factor that is required for the gene expression program leading to plasma cell differentiation . By contrast, NF-κB activation has been shown to induce expression of IRF4 that is required for differentiation of B cells to Ig-secreting plasma cells  and is located (IRF4, 6p24-25; AC Grammer et al., unpublished observation) in a genetic region of a previously described SLE susceptibility locus [18–21]. Notably, the p38 MAPK regulates the production of a number of cytokines, including IL6  that promotes differentiation and survival of plasma cells [24–27]. Using mice generated in the classic HEL/anti-HEL double transgenic murine system, in which the mouse expresses both the autoAg (HEL) and the surface Ig specific for the HEL autoAg, differential signaling through surface immunoglobulin has been shown to lead to tolerance or a positive immune response . Whereas activation of JNK and NF-κB leads to an immunogenic response, NFAT has been shown to mediate B cell tolerance. Interestingly, NFAT activation that leads to tolerance in this system has been shown to induce a E2 ubiquitin ligase family member called E2-20K  that is upstream of the GRAIL E3 ubiquitin ligase molecule reported to be expressed in anergic T cells . Prolonged expression of CD154 on T cells in the circulation of active SLE patients has been shown to be related to a defect in the anergic pathway leading to enhanced activation of ERK . In addition, inducible CD154 expression on human B cells has been shown to be mediated by the MKK1-ERK as well as the NF-κB signaling cascades . The importance of these observations is emphasized by the finding that interrupting in vivo CD154–CD40 interactions in active SLE patients leads to a decrease in circulating plasma cells, anti-dsDNA antibody levels and disease activity . As an example of the use of multiparameter intracellular flow cytometry to assess signaling status of lymphocytes in patients with autoimmune disease, methodololgy was developed to analyze activated kinases in primary B cells using antibodies that recognize pMAPKs such as ERK, JNK and p38. In addition, novel techniques were developed that assess the status of NF-κB activation in primary B cells by analysis of the phosphorylation and degradation of IκB proteins that release active NF-κB dimers for translocation to the nucleus and control of gene expression. These examples clearly demonstrate the potential of multiparameter intracellular flow cytometric analysis to assess signaling abnormalities in primary lymphocytes from nonautoimmune normal individuals or those with autoimmune diseases such as SLE. To validate flow cytometric analysis of MAPKs in human B cells, 300,000 cells from the Epstein-Barr virus-negative Ramos B cell line were preincubated at 37°C for 1 hour to normalize baseline kinase activation before a 15 min stimulation in the presence or absence of recombinant CD154 (hCD154-mCD8 fusion protein, Ancell, Bayport, MN, USA), a stimulus that has been previously been shown to induce phosphorylation of ERK, JNK and p38 . Kinase activation was frozen in time before intracellular flow cytometric analysis by fixation and permeabilization for 10 min at room temperature with the proprietary 'FACSjuice' reagent from Becton Dickinson. Cells were washed with a 1% BSA/PBS solution before nonspecific staining was blocked at 4°C for 15 min with a 10% solution of rat and donkey serum (Jackson ImmunoResearch, West Grove, PA, USA) in PBS. Cells were stained for the presence of activated MAPKs for 30 min at 4°C with 3 μg mouse IgG2a anti-pERK (Santa Cruz Biotechnologies, Santa Cruz, CA, USA) or the isotype-matched control P1.17 (ATCC, Gaithersburg, MD, USA) to analyze activated ERK, 3 μg mouse IgG1 anti-pJNK (Santa Cruz Biotechnologies) or the isotype-matched control MOPC (ATCC) to analyze activated JNK or 3 μg mouse IgM anti-p-p38 (Santa Cruz Biotechnologies) or the isotype-matched control mouse anti-pan Pig (BD Pharmingen) to analyze activated p38. Cells were washed with a 1% BSA/PBS solution before additional nonspecific staining was blocked at 4°C for 15 min with a 10% solution of rat and donkey serum (Jackson ImmunoResearch) in PBS. Specificity of staining was demonstrated by incubation in the presence or absence of the peptide used to immunize animals for the preparation of the mAb (Santa Cruz Biotechnologies). Activated kinase staining was developed by an incubation for 30 min at 4°C in the dark with 6 μl rat anti-mouse IgG2a/2b-PE, 6 μl rat anti-mouse IgG1-PE (Becton Dickinson) or biotinylated donkey anti-mouse IgM (Jackson Immunoreasearch) and 6 μl strepavidin PE (Becton Dickinson). Cells were washed and resuspended in 1% paraformaldehyde before analysis using the FACS Calibur (Becton Dickinson). The conditions used for the Western blots that confirmed results obtained by intracellular flow cytometry have been described previously . A novel technique was developed to assess NF-κB activation in single cells by intracellular flow cytometry. Three hundred thousand cells from the Epstein-Barr virus-negative Ramos B cell line were preincubated at 37°C for 1 hour in the presence of 10 μg/ml cycloheximide to inhibit new protein synthesis and thus normalize baseline IκB levels. Ramos B cells were then activated in the presence or absence of recombinant CD154 (hCD154-mCD8 fusion protein) for 15 min, a stimulus that has been previously shown to induce IκB phosphorylation and degradation that lead to NF-κB activation . IκB phosphorylation and degradation were frozen in time before intracellular flow cytometric analysis by fixation and permeabilization for 10 min at room temperature with the proprietary 'FACSjuice' reagent (Becton Dickinson). Cells were washed with a 1% BSA/PBS solution before non-specific staining was blocked at 4°C for 15 min with a 10% solution of rat and donkey serum (Jackson ImmunoResearch) in PBS. Cells were analyzed for phosphorylated and degraded IκB proteins by staining for 30 min at 4°C with 3 μg mouse IgG1 anti-IκBα mAb (Becton Dickinson/Transduction Laboratories), phosphospecific IκBα mAb (Ser 32/ser 36; Cell Signaling Technologies) or the isotype-matched control MOPC (ATCC). Cells were washed and blocked as above before incubation for 30 min at 4°C in the dark with 6 μl rat anti-mouse IgG1-PE (Becton Dickinson). Alternatively, cells were stained with 3 μg rabbit anti-IκBβ or -ε antibody or 3 μg control rabbit Ig (Santa Cruz Biotechnologies), washed, and blocked before development with a 1: 50 dilution of donkey anti-rabbit-FITC (Jackson ImmunoResearch). Cells were washed and resuspended in 1% paraformaldehyde before analysis using FACS Calibur (Becton Dickinson). The conditions used for the Western blots that confirmed results obtained by intracellular flow cytometry have been described previously . To compare MAPK and NF-κB activation in human B cells from the periphery of SLE patients or normal, nonautoimmune controls, blood was collected in cell preparation tubes (CPT; Becton Dickinson) and PBMCs isolated following the manufacturer's instructions. PBMCs were preincubated at 37°C for 1 hour to normalize baseline conditions before staining for CD19 with APC-conjugated anti-CD19 mAb (Becton Dickinson) followed by staining for MAPKs and IκB proteins as described above. Human B cells from the Ramos B cell line R2G6 were used to develop a method to follow the status of MAPKs and the NF-κB cascade by multiparameter intracellular flow cytometry (Figs 1 and 2). To assess phosphorylated and thus activated MAPKs, R2G6 cells were fixed, permeabilized and stained with phosphospecific antibodies to ERK, JNK and p38 in the presence or absence of peptide immunogens used to generate the pERK, pJNK and p-p38 antibodies. pERK, pJNK and p-p38 were identified in B cells from the Ramos cell line by Western Blotting (Fig. 1c) or by intracellular flow cytometry (Fig. 1a,1b). Importantly, intracellular flow cytometric staining of Ramos B cells with pERK, pJNK or p-p38 was reversed by peptide preincubation (Fig. 1a). CD40 ligation on Ramos B cells further increased pERK, pJNK and p-p38 in a manner that was equivalently detectable by Western Blotting or intracellular flow cytometry (Fig. 1b,1c). Assessment of extracellular regulated kinase (ERK), jun N-terminal kinase (JNK) and p38 mitogen activated protein kinase (MAPK) activity in human B lymphocytes by intracellular flow cytometric analysis. R2G6 cells (3 × 105) were fixed, permeabilized, incubated in the presence or absence of a blocking peptide and stained with isotype matched control antibodies or phosphospecific antibodies that recognize pERK, pJNK and p-p38 (a) immediately or (b) following incubation with increasing amounts of rCD154 for 15 min at 37°C. Dot plots of cell size on the x-axis versus fluorescence intensity in the channel that detects the fluorochrome conjugated secondary antibody on the y-axis are shown in (a). Histograms of fluorescence intensity of the channel that detects the fluorochrome conjugated secondary antibody are shown in (a) and (b). The percentage of positive cells and the mean fluorescence intensity (MFI) of positive staining are indicated. The solid line indicates the division between negative background staining of isotype-matched control antibody and positive staining with the pMAPK antibody. (c) Western blot analysis of pERK, pJNK or p-p38 expression in R2G6 cells following incubation with rCD154 for 15 min at 37°C. Assessment of NF-κB activation in human B lymphocytes by multiparameter intracellular flow cytometric analysis of IκB isoforms (-α, -β, -ε) and the phosphorylation status of IκBα. R2G6 cells (3 × 105) were incubated with rCD154 in the presence or absence of 30 μM of the proteosome inhibitor lactacystein (LAC) or the inhibitor of IκB phosphorylation BAY11-7082 (BAY; Calbiochem) for 15 min at 37°C. Cells were fixed, permeabilized and stained with isotype-matched control antibody or antibody that recognize (a) IκBα, pIκBα, (b) IκBβ or IκBε. Two independent experiments are presented in both (a) and (b). Experiment 1 in (a) depicts IκBα staining following CD154 stimulation in the presence or absence of LAC. Experiment 2 in (b) depicts IκBα and pIκBα staining in the presence or absence of LAC. It is important to note that R2G6 cells are known to have a high level of constitutive NF-κB activation, accounting for the large percentage of cells expressing p-IκBα. Experiment 1 in (b) depicts staining for IκBβ following stimulation with CD154 in the presence or absence of LAC. Experiment 2 in (b) depicts staining for IκBε following stimulation with CD154 in the presence or absence of LAC. Dot plots of cellular size or complexity on the x-axis versus fluorescence intensity in the channel that detects the fluorochrome conjugated secondary antibody on the y-axis are shown in (a) and (b). Insets of histograms of fluorescence intensity of the channel that detects the fluorochrome conjugated secondary antibody are shown in (a) and (b). The percentage of positive cells and the mean fluorescence intensity (MFI) of positive staining are indicated. The solid line indicates the division between negative background staining of isotype-matched control antibody and positive staining with the antibody that recognizes a specific IκB. (c) Western blot analysis of pIκBα as well as total IκBα, -β and -ε following CD154 stimulation in the presence or absence of LAC or BAY11-7082 (BAY). The experiments presented in Fig. 1 conclusively demonstrate that activation of the MAPKs ERK, JNK and p38 can be detected in human B cells in a specific manner that is blocked with the peptide immunogen used to make the phosphospecific antibodies. Monoclonal antibodies to pERK, pJNK and p-p38 have cleaner staining with less nonspecific fluorescence background detectable than polyclonal goat or rabbit antibodies to pERK, pJNK or p-p38 tested (data not shown). In addition, the staining obtained with the IgM anti-p-p38 mAb was much brighter than that obtained with IgG monoclonal antibodies to p-p38 (data not shown), presumably because of the pentavalency of the IgM molecule. The results presented in Fig. 1 in B cells are consistent with previously published reports [5, 8, 11] that demonstrated staining of phosphorylated MAPKs in activated peripheral T cells or T cell lines. The status of the NF-κB pathway was assessed in Ramos B cells following preincubation with an inhibitor of protein synthesis, cycloheximide. Inhibition of new protein synthesis is necessary, since IκB proteins are degraded as part of the signaling pathway and NF-κB activity itself induces new protein synthesis of IκB proteins. Following engagement of CD40 on Ramos B cells with rCD154, the phosphorylation of IκBα and the degradation of IκBα, -β and -ε were detected by Western Blotting (Fig. 2c) and intracellular flow cytometry (Fig. 2a,2b). CD154-induced degradation of all IκB isoforms was reversed by an inhbitor of proteosome activity, lactacystein (Fig. 2a,2b,2c). The experiments presented in Fig. 2 have described a novel method to assess NF-κB activation in human cells and have conclusively demonstrated that NF-κB activation can be detected in human B cells in a specific manner that is blocked by inhibiting activity of the proteosome, with lactacystein, that degrades phosphorylated IκB proteins. Importantly, cells must be preincubated with cycloheximide that blocks new protein synthesis so that changes only in existing IκB proteins can be assessed. Figure 3 demonstrates the practical usefulness of multiparameter intracellular flow cytometry to compare and contrast signaling status of lymphocytes in patients with autoimmune diseases, such as SLE, with lymphocytes from normal, nonautoimmune individuals. PBMCs from active SLE patients or normal individuals were stained for CD19 and then for phosphorylated IκBα, ERK, JNK or p38. Although many groups have demonstrated that surface proteins can be stained before or after the phosphospecific antibodies, it should be noted that surface proteins should always be stained after kinase staining when using indirect methods with a fluorochrome-conjugated secondary to eliminate cross-reactivity of the secondary with the antibody to the surface protein. Seven active SLE patients and seven normal control individuals were examined. The percentage of pIκBα+ cells (Fig. 3) and the level, or mean fluorescence intensity (MFI), of pIκBα staining (data not shown) was not significantly different in CD19+-gated B cells from active SLE patients or normal control individuals. By contrast, there was a significantly higher percentage of CD19+ B cells from active SLE patients that were positive for pERK, pJNK and p-p38 compared with CD19+ B cells from normal control individuals (Fig. 3). The level, or MFI, of staining for pERK, pJNK and p-p38 was not significantly different in SLE or normal B cells (data not shown). These experiments have demonstrated that assessment of signaling status in lymphocytes from lymphopenic patients with autoimmune disease is possible and informative. The importance of the development of a sensitive assay of kinase activation in a small number of cells is particularly important for analysis of peripheral B cells from human patients. The specific experiments in Figs 1,2,3 show that a novel multiparameter intracellular flow cytometric method has been developed to analyze both the MAPK and NF-κB signaling cascades in a small number of primary B cells from human patients. This technique will allow assessment of kinase activation in situations where cell numbers are limiting and/or the number of samples is great, such as in a clinical trial. Multiparameter intracellular flow cytometry reveals elevated percentages of B lymphocytes in the periphery of systemic lupus erythematosus (SLE) patients with spontaneous activation of extracellular regulated kinase (ERK), jun N-terminal kinase (JNK) and p38 mitogen activated protein kinases (MAPKs). Peripheral B lymphocytes isolated from SLE patients (n = 7) or nonautoimmune normal individuals (n = 7) were fixed, permeabilized and stained with phosphospecific antibody for pIκBα, pERK, pJNK or p-p38. The mean ± SEM percentages of CD19+ B cells positive for each phospho-Ab are shown graphically. *P < 0.05 by Student's t test. Multiparameter intracellular flow cytometric analysis of signaling status of human lymphocytes was pioneered 10 years ago by Bernard Rossi's laboratory at the INSERM in Nice, France . Many groups have followed up the initial report of Rossi and colleagues that cells containing proteins with pTyr residues could be individually identified immediately ex vivo or following in vitro stimulation by surface staining in combination with intracellular staining with a phosphospecific antibody. Presently, there are now published reports of the utilization of multiparameter intracellular flow cytometry to identify specifically not only phosphorylated residues, but also individual phosphorylated proteins such as STATs, MAPKs, AKT [5, 8, 35], BTK  and VASP  in cells from many sources. Flow cytometric analysis of kinase activation utilizing phosphospecific antibodies to the kinases listed above has been utilized to detect these activated signaling proteins in peripheral blood (platelets, lymphocytes, malignant cells), cord blood (lymphocytes), G-CSF mobilized CD34+ stem cells and bone marrow (lymphocytes precursors, malignant cells). There are numerous advantages to multiparameter intracellular flow cytometric analysis of signaling status in cells compared to traditional biochemical techniques that measure cytoplasmic events such as in vitro kinase assays or Western blotting with phosphospecific antibodies and nuclear events with EMSA or with transfected reporter constructs that assay the presence of specific activated transcription factors. The primary advantage is that the flow cytometric technique requires many fewer cells and is at least 10-fold more sensitive when parallel samples are compared to Western blotting with the same phosphospecific antibodies. The ability to examine signaling status in a small number of cells expands the source of cells that can be examined to include such populations as the rare CD34+ stem cells that may number less than one in a hundred in a G-CSFmobilized sample at one extreme to rare B cell populations in lymphopenic patients such as plasma cells which are often 0.1% of the circulating B cell pool, which in lymphopenic SLE patients may be less than 0.05% of the PBMCs. In addition, rare subpopulations of circulating lymphocytes can be examined for signaling status in a multiparameter fashion using many fluorochrome conjugated antibodies to surface proteins to identify multiple subsets and/or many different phosphospecific antibodies to unique cellular proteins. Moreover, signaling status in many cellular subsets can be examined simultaneously with dyes that discriminate live and dead cells such as ethidium monoazide. The second major advantage to the multiparameter flow cytometric technique to measure signaling status in cellular subsets is that many studies have demonstrated that cryopreserved cells are not much different to fresh cells in terms of signaling status if preserved and stored correctly. This allows serial samples, as may occur during a clinical trial, to be stored as they arrive and then stained at one time. Although theoretically this serial analysis of signaling status would be possible with biochemical techniques, the large number of purified cells required at each time point often makes this approach unfeasible. The third advantage is that samples can be rapidly fixed and permeabilized at the whole blood stage, thus preserving the immediate ex vivo examination of signaling status that may be altered by the cellular subset purification that is required for biochemical techniques. There are several important points to be highlighted when performing multiparameter intracellular flow cytometric analysis of cellular signaling status. Importantly, temperature control of samples from the harvest to the time of the experiment must be monitored carefully. Often, the temperature of the samples and the time period that elapses until the researcher receives the sample after harvest are not easily controlled. For this reason, a brief preincubation period at a constant temperature should be employed to normalize baseline cellular activity. Furthermore, if samples are analyzed following stimulation with an exogeneous agent, the time of activation should be as brief as possible to be sure that direct signaling events following stimulation are being analyzed. During the development of a new phosphospecific experimental techniques, there are several controls that are useful to demonstrate specific staining of the phosphoprotein. One approach is to use cells from subjects or mice genetically deficient in the kinase itself or an upstream kinase [7, 10]. Another approach is to demonstrate reversibility of staining in the presence of the immunogen peptide as shown in Fig. 1 or in the presence of a known inhibitor of the signaling pathway as shown in Fig. 2. Data analysis is an important aspect of multiparameter flow cytometric analysis of signaling status of cells. The flow cytometric technique allows simultaneous gating of multiple cellular subsets within a sample. In addition, the percentage of cells positive for a given phosphoprotein as well as the level of the phosphoprotein that is directly proportional to the MFI of staining for the phosphoprotein can be assessed. Each of these parameters alone as well as an index can be used to assess signaling status of a given phosphoprotein. For example, biochemical techniques such as Western blotting give a measure of total phosphoprotein present in a particular sample that takes into account both the percentage of the population that is positive as well as the level of expression in that population. In some instances, an index of phosphoprotein staining that is the percentage of the population that is positive for a phosphoprotein multiplied by the MFI that is directly proportional to the expression level of the phosphoprotein can be used to compare signaling status results obtained by Western blotting directly versus multiparameter flow cytometric staining. There are a few disadvantages to multiparameter flow cytometric analysis of cellular signaling status when compared with biochemical techniques. These include the necessity for an antibody that recognizes the phosphorylated form of the protein. Biochemically, the signaling state of a protein can be examined in the absence of such reagents directly by antibody immunoprecipitation of the protein followed by an in vitro kinase assay with substrate and radioactively labeled ATP or indirectly by transfection with a reporter construct that measures a downstream outcome of kinase activation such as ERK activation of AP-1. Secondly, multiparameter flow cytometric analysis of cellular signaling status cannot easily discriminate between events that occur cytoplasmically versus in the nucleus. By contrast, biochemical purification of lysates from either cytoplasm or nucleus can be used for in vitro kinase assays or EMSAs described above. Finally, multiparameter flow cytometric analysis of signaling status with phosphospecific antibodies cannot reliably tell the difference between kinase isoforms, such as ERK1 (p42) and ERK2 (p44) that can be easily detected by Western blotting (Fig. 1c). As a corollary, one can only state the total phosphorylated state of a particular kinase. For example, if cells expresss both ERK1 and ERK2, following a given stimulation one cannot tell if one or both ERK isoforms is phosphorylated. By contrast, this question can be easily answered by biochemical immunoprecipitation of each isoform individually followed by in vitro kinase assays. In summary, the advantages of multiparameter intracellular flow cytometric analysis of cellular signaling status are numerous and, if one has enough cells from a given sample and would like to ask the questions brought up as disadvantages to the flow cytometric technique, one can do the biochemical experiments in parallel. Multiparameter intracellular flow cytometry is a valuable technique that has been developed over the last 10 years from the primitive analysis of total pTyr-containing proteins in activated primary human T cells to the current ability to follow specific phosphorylated proteins, such as those in the MAPK and NF-κB signaling cascades, in rare lymphocyte populations as might be found in lymphopenic SLE patients. Fixation of the cells to be analyzed is important to cross-link and stabilize the cellular structure in preparation for permeabilization and access of the phosphospecific antibody to their targets, although the exact percentage of paraformaldehyde (range 1–4%) used for this procedure does not seem to be of great importance. Effective permeabilization of fixed cells has been achieved with methanol, Triton X-100 or saponin. Importantly, a recent study has compared these various fixation and permeabilization conditions and concluded that they all work, but that 1.5% paraformaldehyde followed by methanol treatment gives optimal results . Surface staining can be performed before or after intracellular staining but conditions should be tested as new surface stains are incorporated in the assay. In addition, various permeabilization conditions may individually affect particular surface stains. Furthermore, cryopreserved and fresh samples gave equivalent results for phosphoproteins tested, but this variable should be confirmed for each phosphoprotein analyzed. In summary, multiparameter intracellular flow cytometry is a valuable tool to assess signaling status quantitatively in a variety of lymphoctye populations. This technique will allow assessment of kinase activation in situations where cell numbers are limiting and/or the number of samples is great, such as in clinical trials of patients with autoimmune diseases. = signal transducers and activators of transcription.